1 minute walk from Farringdon Tube Station. What Should I Build or Write, Against the Fall of Night? 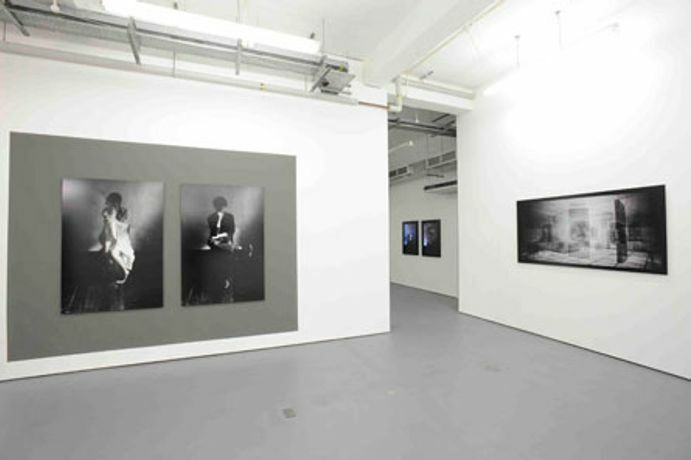 HotShoe Gallery supports experimentation within photographic art, film, video and installation. This exhibition will pay particular attention to the concept of ?exposure?, introducing new work by Torsten Lauschmann, David Birkin and Benjamin de Burca. Exposure refers both to the photographic technique of exposing light and to the idea of exposing the mind of the photographer and his subject. In his new series, ?The Darker Ages?, Torsten Lauschmann employs image-making techniques from the past and the present, in order to explore the tensions in the relationships between old and new technology. In ?Contemporary Gear Box?, a slide projector is used to present a computer-generated image of a system of cogs. In this image Lauschmann uses 20th-century digital technology to re-create one of the oldest forms of labour-saving technology known to mankind. In his experimentations, with these technologies, he exposes ?invisible? aspects of image making; framing, perspective, depth of space, perceivable illusions and narratives. David Birkin?s work is informed by the history of photography and its relationship to performance in contemporary art. For the series ?Confessions?, Birkin invited members of his family to confess a secret they had never previously revealed. When they felt ready, they opened the shutter and when finished they closed it again, so that each photograph?s exposure was determined by the duration of its subject?s confession. For the series ?Form?, the exposures corresponded to the length of time the artist could maintain a ?stress position? : an interrogatory technique employed by military personnel to forcibly extract a confession or other information. The works relate to certain aestheticised images of suffering in the Christian art historical tradition and Modernist preoccupations with objectifying the body. Benjamin de Burca uses light in more than one way in the creation of his work. He has taken photographs of fire, at night, in the dark. The prints of these images are then sliced into using a laser cutter ? the light of the laser literally burns the print apart ? and the pieces are re-arranged into new configurations. The resulting collages oscillate between representation and abstraction; and the means by which the images are produced evoke the fundamental properties of fire: destruction and creation.